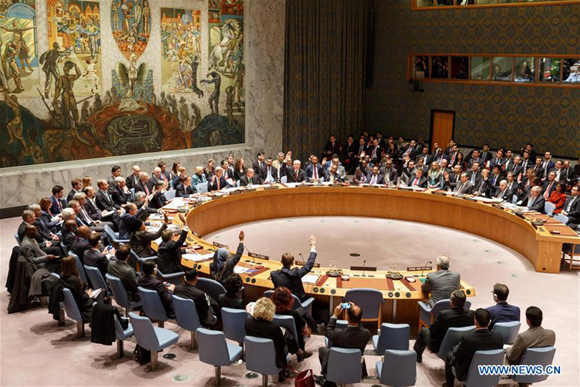 The UN Security Council on Friday adopted a resolution endorsing an international roadmap for a Syrian-led political transition in order to end the country's conflict, which calls for Syria peace talks to begin in early January. The unanimously-adopted resolution also calls for a nationwide ceasefire in Syria to come into effect "as soon as the representatives of the Syrian government and the opposition have begun initial steps towards a political transition under UN auspices." The 15-nation council expressed its support for statements agreed during previous talks in Geneva, Switzerland, and Vienna, Austria, while stressing that "the Syrian people will decide the future of Syria." It said "the only sustainable solution to the current crisis in Syria is through an inclusive and Syrian-led political process that meets the legitimate aspirations of the Syrian people." Friday's Security Council meeting was chaired by U.S. Secretary of State John Kerry, as the United States holds as the council's rotating presidency for the month of December. Kerry said after the vote that the resolution has sent a clear message that "the time is now to stop the killing in Syria." The resolution has requested UN Secretary-General Ban Ki-moon to convene representatives of the Syrian government and the opposition for peace talks "on an urgent basis," and also to determine the requirements and modalities of a ceasefire, which are also stated in Geneva and Vienna documents. At the meeting, UN Secretary-General Ban pledged that "the United Nations stands ready to undertake these important tasks." He noted that "the Syrian conflict began with peaceful popular demands for political change, but it soon became defined by internal, regional and international divisions -- including in this very Council." The conflict in Syria erupted in March 2011. The nearly-five-year war has claimed more than a quarter million lives. Ban urged the Syrian parties to immediately stop the use of indiscriminate weapons against civilians and to halt attacks on medical and educational facilities. He also asked the Syrian parties to allow unconditional and unimpeded access for humanitarian aid convoys to help tens of thousands of people in need. According to UN humanitarian agency, some 6.5 million Syrians are internally displaced. About 4.5 million people continue to live in areas that are hard to reach for the humanitarian community, while almost 400,000 of those are besieged.